Name Variation Reber Jack Marshall was also known as Jack. Reber Jack Marshall was born on 12 October 1910 at Missouri. He was the son of Stephen Amos Marshall and Lillian Mary Foster. Reber Jack Marshall married Velma Lynn in 1929. Reber Jack Marshall married Mena Carmichael before 1972. Reber Jack Marshall and Mena Carmichael were divorced in April 1972. Reber Jack Marshall married Delores M. Stonger after 1972. Reber Jack Marshall died on 4 May 1982 at age 71. [S243] U.S. Federal Census 1920 U.S. Federal Census, by Ancestry.com, Year: 1920; Census Place: Sarcoxie, Jasper, Missouri; Roll: T625_922; Page: 6A; Enumeration District: 95; Image: 1098. Married Name 19 August 1942 As of 19 August 1942,her married name was Marshall. Irene Reynolds married William Truman Marshall, son of Stephen Amos Marshall and Lillian Mary Foster, on 19 August 1942 at Jasper, Missouri. Married Name 5 February 1925 As of 5 February 1925,her married name was Marshall. Isabella McComb married Dewey Winfred Marshall, son of Stephen Amos Marshall and Lillian Mary Foster, on 5 February 1925 at Carthage, Jasper, Missouri. Name Variation Lilah Johnson was also known as Lylial. Name Variation Lilah Johnson was also known as Lyla. Name Variation Lilah Johnson was also known as Lyliah. Married Name 13 June 1916 As of 13 June 1916,her married name was Marshall. Lilah Johnson married Earnest James Marshall, son of Stephen Amos Marshall and Lillian Mary Foster, on 13 June 1916 at Carthage, Jasper, Missouri. Married Name 25 August 1917 As of 25 August 1917,her married name was Marshall. Myrtle Gaither married Edward Marshall Sr., son of Stephen Amos Marshall and Lillian Mary Foster, on 25 August 1917 at Carthage, Jasper, Missouri. Children of Myrtle Gaither and Edward Marshall Sr.
Raymond L. Welch married Ruth May Marshall, daughter of Stephen Amos Marshall and Lillian Mary Foster. Raymond L. Welch was born in 1904. Name Variation Jake F. Arnold was also known as Jakie F.
Jake F. Arnold married Ruby Irene Marshall, daughter of Stephen Amos Marshall and Lillian Mary Foster. Manford C. Wilkerson was born on 18 February 1908 at Lucas, Kansas. He married Bonnie Lee Chambers, daughter of Aubra William Chambers and Bessie L. Foster, on 26 April 1962 at Salina, Kansas. Manford C. Wilkerson died in January 1981 at age 72 Manford C Wilkerson obituary. Name Variation Ezra Pointer was also known as Poynter. 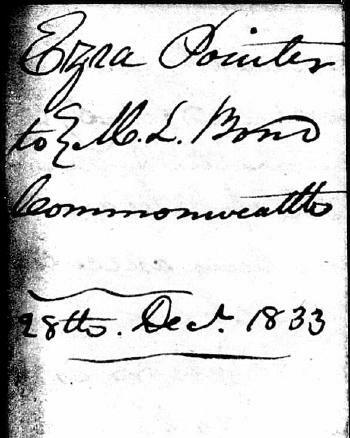 Ezra Pointer was born on 12 December 1812 at Kentucky also reported as 27 Dec 1812; also reported as 8 Jul 1810. 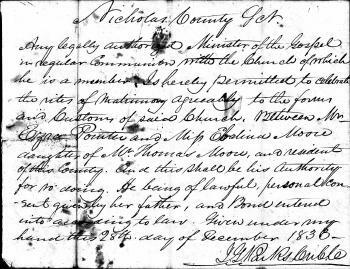 He and Evelina Moore obtained a marriage license on 28 December 1833 at Nicholas, Kentucky. Ezra Pointer married Evelina Moore, daughter of William Thomas Moore and Nancy Standley, on 30 December 1833 at Nicholas, Kentucky. Ezra Pointer died on 28 October 1883 at Diamond Grove Prairie, Newton, Missouri, at age 70. He was buried on 30 October 1883 at Crouches Cemetery aka Greenwood Cemetery, Diamond, Newton, Missouri. Total All Persons - Free White, Free Colored, Slaves: 6. [S249] U.S. Federal Census 1850 U.S. Federal Census, by Ancestry.com, Year: 1850; Census Place: District 1, Nicholas, Kentucky; Roll: M432_215; Page: 484A; Image: 425. 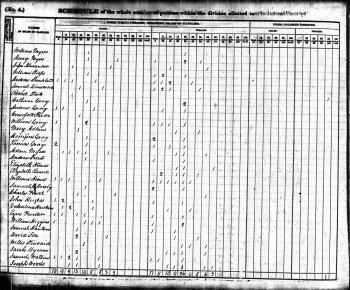 [S248] U.S. Federal Census 1860 U.S. Federal Census, by Ancestry.com, Year: 1860; Census Place: District 1, Nicholas, Kentucky; Roll: M653_389; Page: 373; Family History Library Film: 803389. 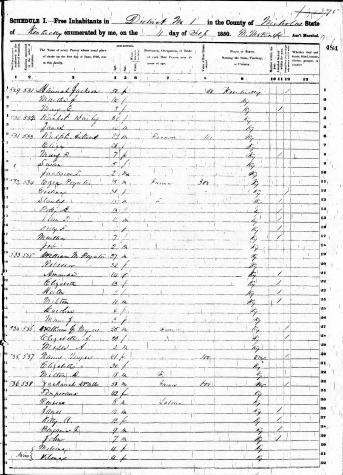 [S247] U.S. Federal Census 1870 U.S. Federal Census, by Ancestry.com, Year: 1870; Census Place: Township 4 Range 2, Marion, Illinois; Roll: M593_253; Page: 227B; Image: 360698; Family History Library Film: 545752. [S246] U.S. Federal Census 1880 U.S. Federal Census, by Ancestry.com, Year: 1880; Census Place: Boone, Bates, Missouri; Roll: 673; Family History Film: 1254673; Page: 13B; Enumeration District: 144; Image: 0336. Name Variation Evelina Moore was also known as Eva. Name Variation Evelina Moore was also known as Ebaline. Name Variation Evelina Moore was also known as Elle L.
Married Name 30 December 1833 As of 30 December 1833,her married name was Pointer. Married Name 30 December 1833 As of 30 December 1833,her married name was Poynter. Evelina Moore was born on 30 November 1812 at Nicholas, Kentucky. She was the daughter of William Thomas Moore and Nancy Standley. 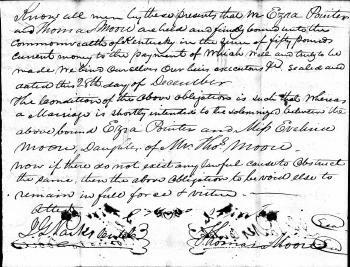 Evelina Moore and Ezra Pointer obtained a marriage license on 28 December 1833 at Nicholas, Kentucky. 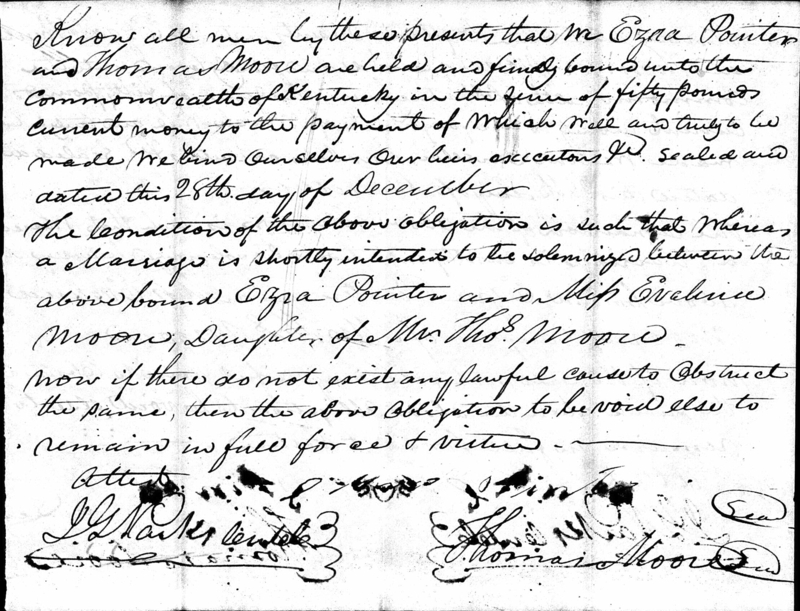 Evelina Moore married Ezra Pointer on 30 December 1833 at Nicholas, Kentucky. Evelina Moore died in 1889 at Merwin, Bates, Missouri. [S246] U.S. Federal Census 1880 U.S. Federal Census, by Ancestry.com, Year: 1880; Census Place: Precinct 4, Erath, Texas; Roll: 1302; Family History Film: 1255302; Page: 78C; Enumeration District: 152. Name Variation Mary A. Pointer was also known as Poynter. Name Variation Mary A. Pointer was also known as Polly A.
Mary A. Pointer was born on 20 May 1837 at Nicholas, Kentucky. She was the daughter of Ezra Pointer and Evelina Moore. Name Variation Martha Hannah Pointer was also known as Poynter. Married Name 22 October 1863 As of 22 October 1863,her married name was Kessler. Martha Hannah Pointer was born on 16 August 1843 at Kentucky also reported as 17 Aug 1843 and Aug 1844. Martha Hannah Pointer married Solomon Kessler on 22 October 1863 at 2nd marriage for him. 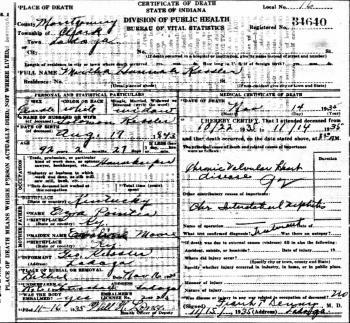 Martha Hannah Pointer died on 14 November 1935 at Montgomery, Indiana, at age 92 Death certificate - Indiana - Martha Hannah (Pointer) Kessler. Martha Hannah Pointer had 7 with 6 living in 1900 children. [S245] U.S. Federal Census 1900 U.S. Federal Census, by Ancestry.com, Year: 1900; Census Place: Clark, Montgomery, Indiana; Roll: 393; Page: 7B; Enumeration District: 0100; FHL microfilm: 1240393. Name Variation Nancy Pointer was also known as Poynter. Nancy Pointer was born circa 1851 at Kentucky. Nancy Pointer died before 1860. Solomon Kessler was born on 17 February 1836 at Virginia. He married unknown (?) before 1858. Solomon Kessler married Martha Hannah Pointer, daughter of Ezra Pointer and Evelina Moore, on 22 October 1863 at 2nd marriage for him. Solomon Kessler died on 12 August 1926 at Indiana at age 90. Edward Marshall Jr. was the son of Edward Marshall Sr. and Myrtle Gaither. Married Name Her married name was (?) Maxwell. (?) Marshall was the daughter of Edward Marshall Sr. and Myrtle Gaither. (?) Marshall married Jerry Maxwell. Jerry Maxwell married (?) Marshall, daughter of Edward Marshall Sr. and Myrtle Gaither. Married Name 1929 As of 1929,her married name was Marshall. Velma Lynn married Reber Jack Marshall, son of Stephen Amos Marshall and Lillian Mary Foster, in 1929. Married Name before 1972 As of before 1972,her married name was Marshall. Mena Carmichael married Reber Jack Marshall, son of Stephen Amos Marshall and Lillian Mary Foster, before 1972. Mena Carmichael and Reber Jack Marshall were divorced in April 1972. Married Name after 1972 As of after 1972,her married name was Marshall. Delores M. Stonger was born on 28 May 1907 at Red Oak. She married Reber Jack Marshall, son of Stephen Amos Marshall and Lillian Mary Foster, after 1972. Delores M. Stonger died in January 1990 at age 82. Married Name 27 July 1879 As of 27 July 1879,her married name was Copple. Mary Elizabeth Foster was born on 17 December 1862 at Kentucky. She was the daughter of Henry Foster II and Catharine Frances Pointer. 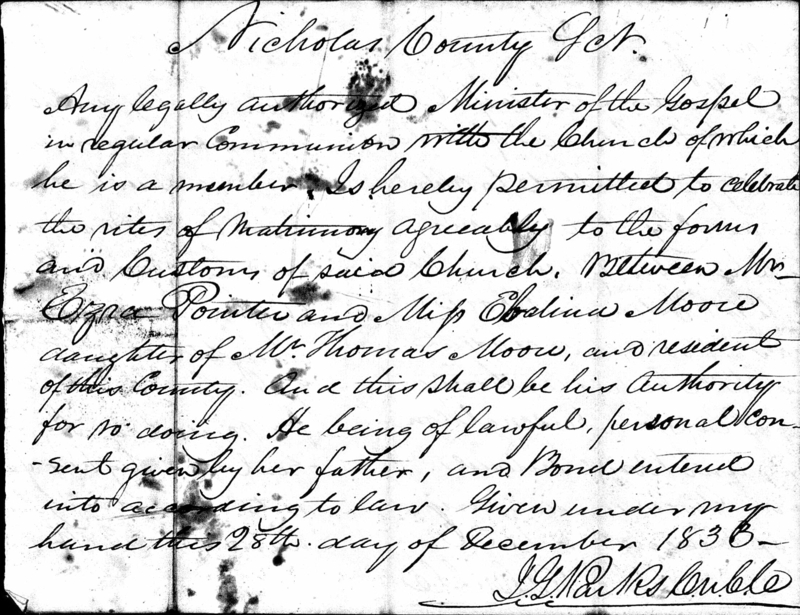 Mary Elizabeth Foster married Jacob Washington Copple, son of Jacob Copple and Margaret Blalock, on 27 July 1879 at Jasper, Missouri, also reported as 1878 and 1880. Mary Elizabeth Foster, as the mother of the bride, consented to the wedding of John Wesley Custis and Elsie Elvira Copple on 27 January 1909 at Carthage, Jasper, Missouri, (since Elsie was under 18); Miss Elsie Copple, daughter of Mr and Mrs J W Copple of West Chestnut and John W Custis, son of Mr and Mrs Charles Custis, were married here. Mary Elizabeth Foster died on 2 December 1946 at Jasper, Missouri, at age 83 Mary Elizabeth (Foster) Copple obituary. She was buried after 2 December 1946 at Oak Hill Cemetery, Carthage, Jasper, Missouri. In 1900 4 with 3 living in 1900. In 1910 4 with 3 living in 1910. [S245] U.S. Federal Census 1900 U.S. Federal Census, by Ancestry.com, Year: 1900; Census Place: Joplin, Jasper, Missouri; Roll: 866; Page: 7B; Enumeration District: 0045; FHL microfilm: 1240866. [S244] U.S. Federal Census 1910 U.S. Federal Census, by Ancestry.com, Year: 1910; Census Place: Carthage Ward 3, Jasper, Missouri; Roll: T624_791; Page: 11A; Enumeration District: 0072; FHL microfilm: 1374804. [S243] U.S. Federal Census 1920 U.S. Federal Census, by Ancestry.com, Year: 1920; Census Place: Carthage Ward 3, Jasper, Missouri; Roll: T625_922; Page: 12B; Enumeration District: 83; Image: 836. Name Variation Jacob Washington Copple was also known as J. W.
Jacob Washington Copple was born on 18 April 1855 at Newton, Missouri. He was the son of Jacob Copple and Margaret Blalock. Jacob Washington Copple married Mary Elizabeth Foster, daughter of Henry Foster II and Catharine Frances Pointer, on 27 July 1879 at Jasper, Missouri, also reported as 1878 and 1880. 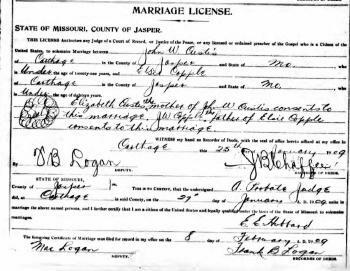 Jacob Washington Copple consented to the marriage of Maude Ellen Cupp and Fred Ulysses Copple on 24 December 1902 at Jasper, Missouri, (since Fred was under 21). 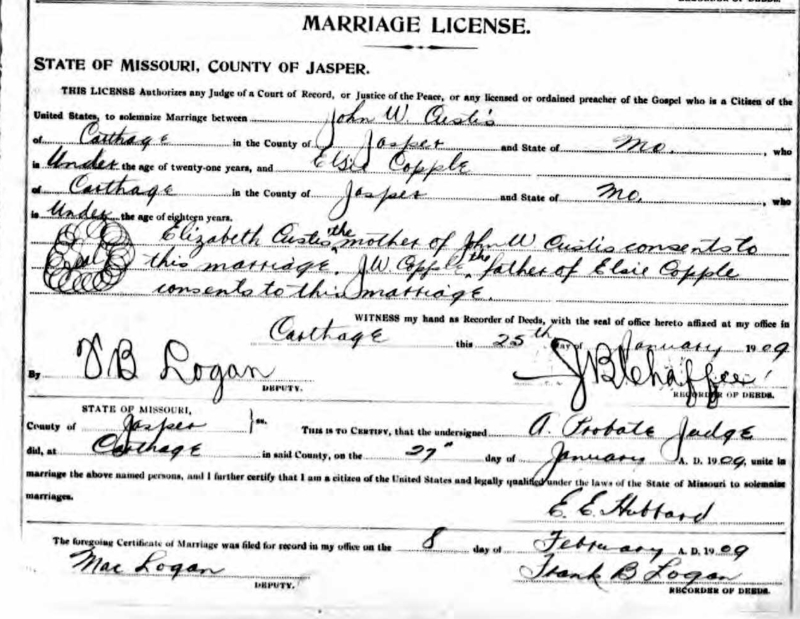 Jacob Washington Copple, as the father of the bride, consented to the wedding of John Wesley Custis and Elsie Elvira Copple on 27 January 1909 at Carthage, Jasper, Missouri, (since she was under 17); Miss Elsie Copple, daughter of Mr and Mrs J W Copple of West Chestnut and John W Custis, son of Mr and Mrs Charles Custis, were married here. Jacob Washington Copple died on 30 March 1922 at age 66 Jacob Washington Copple obituary. He was buried on 1 April 1922 at Oak Hill Cemetery, Carthage, Jasper, Missouri. Fred Ulysses Copple was born on 29 March 1884 at Newton, Missouri. He was the son of Jacob Washington Copple and Mary Elizabeth Foster. 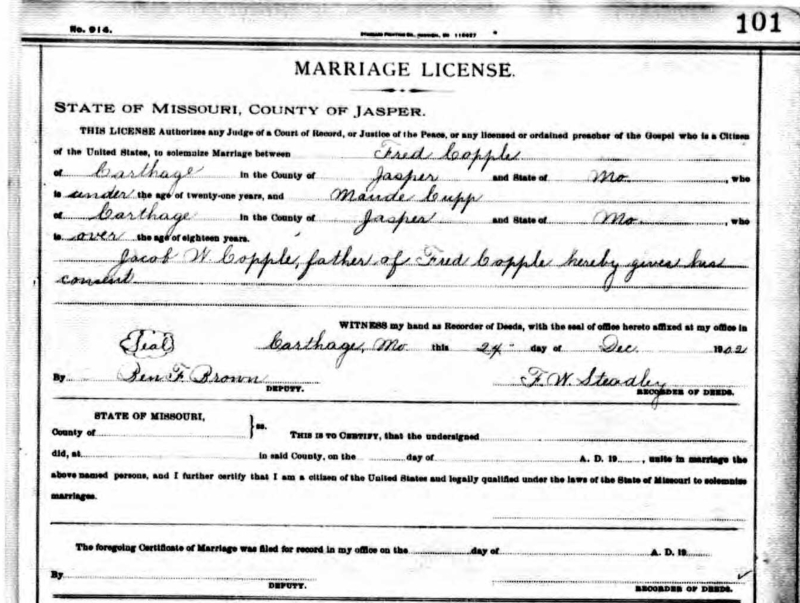 Fred Ulysses Copple married Maude Ellen Cupp on 24 December 1902 at Jasper, Missouri. 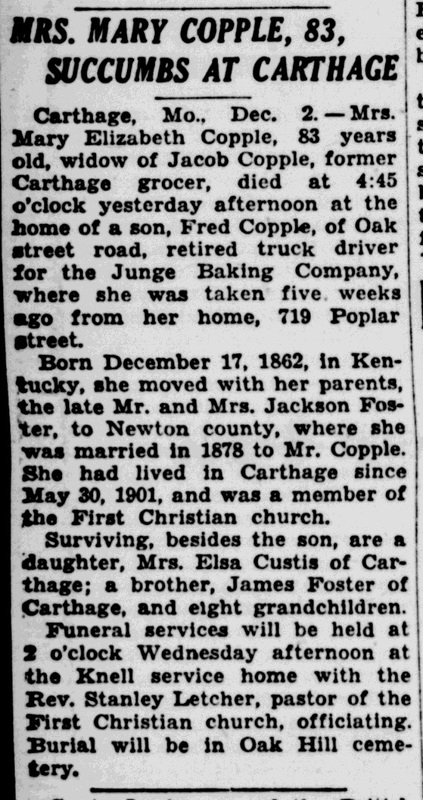 Fred Ulysses Copple witnessed the death of Mary Elizabeth Foster on 2 December 1946 at Jasper, Missouri; Mary Elizabeth (Foster) Copple obituary. Fred Ulysses Copple died on 30 October 1956 at Jasper, Missouri, at age 72. Name Variation Elsie Elvira Copple was also known as Elsa. Married Name 27 January 1909 As of 27 January 1909,her married name was Gustin. Married Name 27 January 1909 As of 27 January 1909,her married name was Curtis. Married Name 27 January 1909 As of 27 January 1909,her married name was Custis. Elsie Elvira Copple was born on 31 August 1891 at Newton, Missouri. She was the daughter of Jacob Washington Copple and Mary Elizabeth Foster. Elsie Elvira Copple married John Wesley Custis on 27 January 1909 at Carthage, Jasper, Missouri, Miss Elsie Copple, daughter of Mr and Mrs J W Copple of West Chestnut and John W Custis, son of Mr and Mrs Charles Custis, were married here. Elsie Elvira Copple and John Wesley Custis were divorced before 1952. 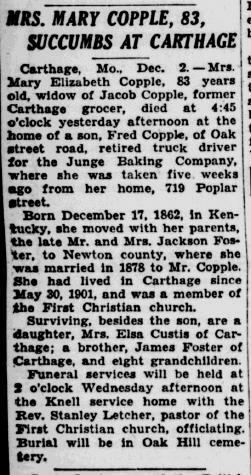 Elsie Elvira Copple died on 27 October 1952 at Carthage, Jasper, Missouri, at age 61. Name Variation John Wesley Custis was also known as Gustin. Name Variation John Wesley Custis was also known as Curtis. John Wesley Custis was born on 21 August 1889 at Newton, Missouri. He married Elsie Elvira Copple, daughter of Jacob Washington Copple and Mary Elizabeth Foster, on 27 January 1909 at Carthage, Jasper, Missouri, Miss Elsie Copple, daughter of Mr and Mrs J W Copple of West Chestnut and John W Custis, son of Mr and Mrs Charles Custis, were married here. John Wesley Custis and Elsie Elvira Copple were divorced before 1952. John Wesley Custis died on 20 April 1954 at Joplin, Jasper, Missouri, at age 64. James Foster was the son of Henry Foster II and Catharine Frances Pointer. James Foster died after 1946. James Foster lived in 1946 at Carthage, Missouri. Name Variation Standley Pointer was also known as Stanley. Standley Pointer was born on 29 December 1834 at Nicholas, Kentucky. He was the son of Ezra Pointer and Evelina Moore. Standley Pointer married Caroline Pointer, daughter of William M. Pointer, on 17 June 1860 at Boone, Indiana. Standley Pointer died on 9 February 1927 at Tyler, Smith, Texas, at age 92. [S247] U.S. Federal Census 1870 U.S. Federal Census, by Ancestry.com, Year: 1870; Census Place: Township 47 Range 30, Jackson, Missouri; Roll: M593_781; Page: 127A; Image: 299116; Family History Library Film: 552280. Name Variation John Thomas Pointer was also known as J. S.
Name Variation John Thomas Pointer was also known as J. T.
John Thomas Pointer was born on 26 May 1839 at Kentucky. John Thomas Pointer married Kesiah Schenck on 1 January 1861 at Montgomery, Indiana. 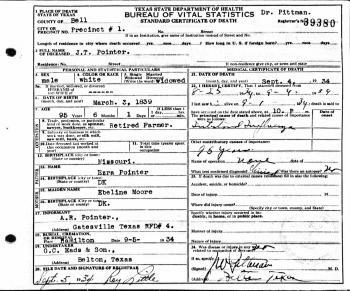 John Thomas Pointer died on 4 September 1934 at Bell, Texas, at age 95 Death certificate - Texas - J T Pointer. [S245] U.S. Federal Census 1900 U.S. Federal Census, by Ancestry.com, Year: 1900; Census Place: Justice Precinct 1, Hamilton, Texas; Roll: 1641; Page: 16B; Enumeration District: 0082; FHL microfilm: 1241641. [S244] U.S. Federal Census 1910 U.S. Federal Census, by Ancestry.com, Year: 1910; Census Place: Hamilton, Hamilton, Texas; Roll: T624_1558; Page: 1A; Enumeration District: 0065; FHL microfilm: 1375571. David Pointer was born on 12 August 1846 at Kentucky. David Pointer died before 1850. Name Variation Job M. Pointer was also known as Jobey. Name Variation Job M. Pointer was also known as Joe. Name Variation Job M. Pointer was also known as Jobe. Job M. Pointer was born on 17 July 1848 at Nicholas, Kentucky. 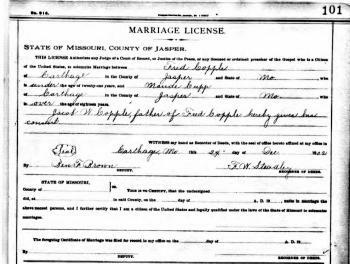 Job M. Pointer married Martha V. Catron on 2 February 1873 at Cass, Missouri. Job M. Pointer died on 3 August 1924 at Timber, Washington, Oregon, at age 76. [S244] U.S. Federal Census 1910 U.S. Federal Census, by Ancestry.com, Year: 1910; Census Place: N Yakima Ward 3, Yakima, Washington; Roll: T624_1675; Page: 5A; Enumeration District: 0286; FHL microfilm: 1375688. [S243] U.S. Federal Census 1920 U.S. Federal Census, by Ancestry.com, Year: 1920; Census Place: Precinct, Deschutes, Oregon; Roll: T625_1493; Page: 7A; Enumeration District: 36; Image: 453.